In my earlier teens I watched a drama series called “Ik Mohabbat Sau Afsaney” penned by one of Urdu Literature’s popular figures Ashfaq Ahmad. A scene in one of episodes shows a man who glorifies women for being the source of mankind’s survival. The scene was a testimony to women’s role in maintaining the social fabric that we possess. Where Pakistan’s TV industry in its golden era created strong female characters, its film medium wasn’t short of females who had substantial onscreen presence and affected their surroundings in a dynamic way. Strong females in dramas like Kasak, Dhoop Kinarey, Zindagi Gulzar ha, Udari, Dastaan and countless others had their counterparts in Pakistani celluloid with gems like “Saheli” (1960), “Zarqa” (1969), “Society Girl”(1976),to name a few that featured & celebrated female greatness in them. Speaking of cinema specifically, even in the days when it was considered to be on its death bed in 90s, films like “Ghooghat”, “Zevar”, “Inteha”, “Mujhe Chaand Chahiye” and “Jannat Ki Talash” included strong female characters although with a progressively decreasing nuance and refinement as the cinema approximated its terminal stage. Across 2010s Pakistani cinema continued its fascination with strong female characters and churned out films like “Dukhtar”, “Bol” and “Verna” continually. While women may still be underrepresented at creative positions like directors, cinematographers, producers and film critics in an industry that is in its infancy, the year of 2018 however stands out as the most progressive year in the past few decades with regard to the women’s characters and their screen presence. We analyze these characters here in a chronological order. 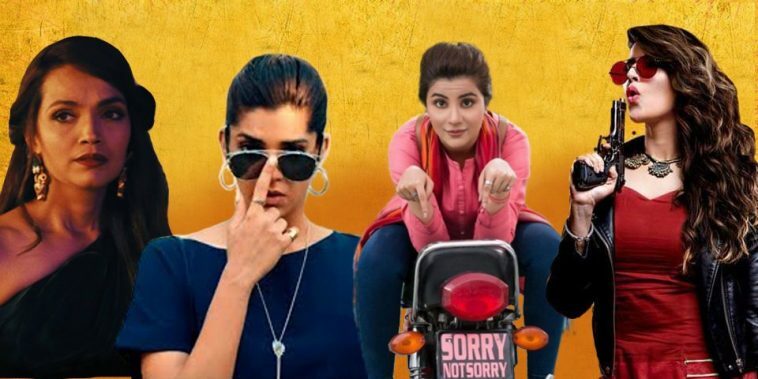 2018 commenced with action comedy “Parchi“ starring and co-produced by Hareem Farooq which although met lukewarm critical reviews was a decent success at box office. Hareem’s character Iman was of a gangster with a heart of gold, carrying a Robin Hood-esque vibes who stands against evils in the society fostered by her very own father and comes out successful at the same time avenging her wronged mother. Closely Followed was the biopic “Motorcycle Girl” that witnessed Sohaye Ali Abro as the Reel life Zainab who travels to Khunjrab Pass on a motorcycle, breaking the stereotypes attached to women in our society and thus dealing with her ordeals on her own terms and becoming a role model for thousands. Where MCG met widespread critical acclaim, it couldn’t earn much at box office because of a limited release and weak marketing. Nevertheless it will remain an iconic film that Pakistani cinema could be proud of. Ali Zafar’s Debut project “Teefa In Trouble” although was centered and titled on its male protagonist had a female character played by Maya Ali who is well aware of what’s missing from her life and strives continuously to live her life on her own terms and never hesitant to make crucial decisions for herself. The climax scene in the train where she stands for herself, alone is a vital moment for keeping the film’s narrative logical. Mahira Khan’s Neeli in Dawn film’s experimental fantasy rom com “7 Din Mohabbat In” is a character that has a body and soul of its own and lives through various hostilities surrounding her, yet supports her love interest and earns the life(& love interest) that she wanted and deserved. While Eid ul Adha saw commercial flicks Like JPNA 2 and PHJ which notoriously relegated women to peripheries, it was Nabeel Qureshi and fizza Ali Meerza’s offering “Load Wedding“, that had Meerab (played by brilliant Mehwish Hayat) and Baby Baji (Faiza Hassan) as two important women that carry forward an important film that Load Wedding was. Where Meerab, despite negativity surrounding her, opts for a job to support herself as a polio worker and doesn’t lose hope, decides to remarry, proving a successful wife and daughter-in-law, her Baby baji, possess immense impact in family matters and hence screen appearance. She is a strong decision maker that ultimately overcomes the unnecessary frustration of being a spinster, thus morphing her life the way she wanted. The year Ended with independent film called “Pinky Memsaab” where the talented Hajra Yamen wowed critics and audience alike the way she portrayed a resilient and determined Pinky. Not lagging far behind was Kiran Malik’s Memsaab who never seizes to discover her true callings and is continuously striving to revive her moribund writing career. Both the ladies have a happy endings in their lives that intelligent cinema audience (somewhat) wanted to witness. According to “Gerbner’s cultivation theory” media can affect believes of people regarding the social world. Across the world women made, produced, directed, centered and driven films are found in no dearth and while it is unjust to expect Pakistani cinema to exert the same level of social effect that Gerbner hypothesized, it could be safely asserted that Pakistani cinema has already taken an important first step in this regard, which is “refraining from relegating women to trivialized rudimentary onscreen characters”. For which, It deserves a Nod. A Doctor by parents wish,a film buff by his nature's and a traveller depending on the money in his wallet.Hassan finds dissecting films & other Arts more interesting than cadavers in Med school.